Oh – Sorry. I was just remembering what a fun song that is to sing at Karaoke bars. Mind you, THAT song is all about a “chain of fools,” whereas I’ve been contemplating Mic’s concept of a chain. His chain would be comprised of…well, NOT fools. Rather, each link would be comprised of a discerning individual who comprehended a more global “vision” and who cared deeply about the sort of issues that affect us all, especially the treatment of, research for and support of those affected by cancer. On the other hand, the concept of even ONE person telling another person and THAT person sharing the information with one person or perhaps SEVERAL people is something that can make an amazing impact. You know that game, “gossip?” Never mind. That doesn’t really apply here, because I would hope that THIS message wouldn’t get distorted into unintelligible gobbledygook. It IS, however, a little like the concept of “six degrees of separation.” OR “Six degrees of Kevin Bacon.” FYI, I’m either four or five degrees from Kevin Bacon (with the given that we’re counting “industrial” films and making it only four if we count TV appearances – TV SERIES, not awards shows). But let me ACTUALLY and TRULY get to the point: Jennette, my Dear Cousin, YOU ARE LINK NUMERO UNO in this “chain of hope,” as imagined by Michele Capaccioli and Henrike Hirsch and embodied in the LIVESTRONG® European Cycling Team, which endeavors to raise A LOT of money for the Lance Armstrong Foundation (and I intend to talk on another occasion why I think one should donate to the Lance Armstrong Foundation). You even got your VERY OWN International mention. And I actually think we can break it down even further. How about 10,000 people donating $2.50? Someone recently mentioned to me that she only had, “Three dollars and twelve pennies to my [her] name.” So $2.50 falls well within that budget. I’m NOT being facetious (not about the actual ISSUE, anyway). Can I put that button in my sidebar? Yes, PLEASE! That would be so great! I will send the image and link code to ANYONE who’d be willing to post it. My name is Michele ‘Mic’ Capaccioli. Kate has just explained very good my fundraising campaign. “The Life has always been a lesson of humility and loyalty (honesty). The matter is not how many years we live, but rather what we do with them”. My father, Lorenzo Capaccioli (Dead for a malignant tumor). 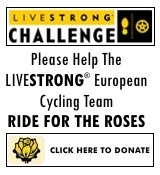 I would be grateful if YOU ALL could help me to raise $ 25,000 USD for the Lance Armstrong Foundation to help the life of those who are living with, through and beyond cancer. Sadly I don’t even have that to my name anymore, but I will try to help as i can as my interesting life permits. It reminds me of two of my favorite movies. ‘Pay it Forward’, And ‘Lorenzo’s Oil’ Both of which I recommend veiwing. As for the matter of impossible, I have several qoutes in my little black book (which actually isn’t black) on the subject. You seldom hit anything unless you aim at it. Your vision determines your destination. Unless we work for the common good, there won’t be any. We make our future by the best use of the present. *The difficult can be done immediatly. The immposible just takes a little longer. There is not obstacle to great, no challenge too difficult, if we have faith. When you have vision you see the invisable, feel the intangible, achieve the impossible. Not all of them neccisarily pertain but I thought I would share them anyway. I have tons more But I don’t think there is enough room for them here. Sorry for being a comment hog Kate! Send me the link for the button and I will put it in my different siggies. I know I’m OLD and all and prone to forgetting to wear pants, but what, precisely are “siggies?” Should I be concerned? Do you need an intervention? Are “siggies” mind-altering or can you get a disease from one? Tell what kind of formatting that “siggies” require and I shall send you the link and button and such. P.S. I’m going to publish all your quotes on WeMustAct.org as “Sarah’s favourites” or something. So you can give me all the quotes you want. And you can “hog” all the space you want, Ms. Survivor. Just getting caught up on my blog reading while little Miss Harper is napping (a MUCH needed nap, by the way – she cut her first tooth today!! ), and I must say I am quite excited about my international mention!! The “chain” is an excellent idea, and I have passed the web link on to a friend who’s mother and two aunt’s are cancer survivors, and who’s uncle died of luekemia, and on to my boss (who is usually a total cheapskate, but has been known to be guilted into giving money to various charities by ME, hehe). Honestly, $25 is really nothing to a lot of people in the grand scheme of things, but in the hands of LAF I know it can do a world of good. Good luck Mic! Yes, $ 25 USD is nothing and it could be for many people who, for instance, go shopping in the day, buying some clothes or something to eat and drink and save each time the sum of money above mentioned for the cancer research. Thanks for the good luck as well. However, I need practice, more donations, otherwise I cannot reach my goal by this large “family” of people. It seems to me, once a person decides to raise money and awareness for the cancer research argues at the same time the fact that this “check” is marked of unsufficient funds. I am talking about the check of generosity and a progress of all trough all as a moral development of today’s society. In fact, this is not merely a political issue, but much more a moral matter. Do we want to see our friends, co-workers, the members of our families, our neighbors etc. dying for cancer or tumor because they have been diagnosed too late or because the treatment they need does not exist?!. I am sure we all answer “No” and I will answer “No” for my grandmother, my mother and my brother. These are the nearest people that compose my family at the moment. My father died of a malignant tumor and what I remember of him is “The life has always been a lesson of humility and loyalty (honesty). The matter is not how many years we live, but rather what we do with them”. This sentence was the response to my question “What I am gonna do if you die”. Thanks for paying attention and god bless you all. WOOT! YAH!! Pay it FORAWARD!!! “Comment voulez-vous gouverner un pays qui a deux cents quarante-six variétés de fromage?